This will be the second of three additional class sessions of Dr. Elsie’s Stern “Navigating the Siddur” course. You do not have had to take the prior session to join the upcoming class cohort. 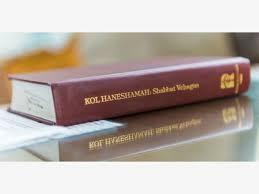 During these Sunday morning sessions, you will learn the matbeah (order) of a Shabbat morning prayer service. You will learn to recognize the key structural elements, or framework, of the service, when and who created the classic prayers, and what might have been the authors’ larger kavannot (intentions) behind the words. This week we will meet in Rabbi Yael's office. This class may be of particular interest for parents whose children will soon be embarking on their b’nai mitzvah preparatory year. Dr. Elsie Stern is vice president for academic affairs and associate professor of Bible at the Reconstructionist Rabbinical College. She is also a key public spokesperson for Reconstructing Judaism and a member of Mishkan Shalom. A vibrant biblical scholar whose teaching often focuses on social justice issues, Dr. Stern has taught widely in the United States and abroad. Her current research explores the transmission and reception of biblical texts in early Jewish settings, with particular interest in how the Torah transmitted by rabbis and teachers, and received by Jewish audiences, is (and always has been) far more expansive and variegated than the written texts themselves. She is the author of From Rebuke to Consolation: Bible, Exegesis and Ritual in the Literature of the Tisha b’Av Season (2004) and has contributed to the Jewish Study Bible and the Women’s Torah Commentary (2008).